Cloth tape is an adhesive tape made with a cloth backing or core. The duct tape is coated with polyethylene to create a higher quality paste. Instead of using a natural adhesive, cloth tape is equipped with a synthetic one so it can be removed easily and leaves little or no residue. The use of cloth makes the tape especially durable and rugged, and promotes flexibility, which can be valuable for certain projects. Also, most cloth adhesive tapes have pinked edges that reduce the chance of fraying, thus maximizing the life of the tape roll. There are a number of different styles of cloth tape on the market that can be used for a variety of purposes. First, we have utility grade cloth tape. Some utility cloth tapes are pressure-sensitive, which means that they are designed to adhere with pressure, not with an adhesive. These tapes are useful in projects where things need to be held together without leaving residue behind. 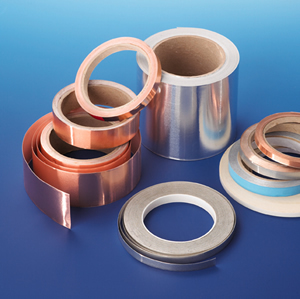 Utility grade tape is used for bundling, heavy carton sealing and general maintenance. Industrial grade cloth adhesive tape is ideal for irregular surfaces. It does not twist or curl during application, making industrial grade tape extremely user-friendly and time efficient. This tape is used for export shipments, splicing, vinyl repair, and general protection. In the medical world, cloth tape (surgical tape) is often used for bandages, as it will bend and flex with the body, and pressure-sensitive dressings can be used to gently cover injuries. Cloth adhesive tape is made with zinc oxide and speeds healing. Because of this, surgical tape is increasingly replacing sutures thus reducing the risk of superficial skin infections. It is also used to secure intravenous lines, ventilation tubes, and other medical equipment in place. A wide range of colors is available, from classic unbleached white to hot pink and even camouflage. Fluorescent cloth tapes have recently found a new market – the night amusement industry. Since this cloth adhesive tape is easy to unwind and can bond to any surface, it has increasingly been used in nightclubs, music halls, or show windows utilizing a black light. A roll of all-purpose cloth tape such as duct tape can be a very useful tool to keep around the house, as it will come in handy for an assortment of tasks. No matter what your mission, you can find a cloth adhesive tape that will impeccably suit the job. On average, consumers buy more than 6,000 tons of duct tape each year. That amount is enough to travel to the moon and back! Adhesive tape can be used for almost anything: arts and crafts, posters, and repairs, just to name a few. The concept of adhesives can actually be traced back all the way to 4000 B.C. Archaeologists once discovered clay pots that were repaired with glue made from tree sap dating back to this time. Not far behind were the Greeks, who concocted glue from ingredients such as egg whites, blood, bones, milk, cheese, vegetables, and grains. The Romans also developed their own version of an adhesive by using tar and beeswax. The first adhesive tape was invented in the 1920’s by a man named Richard Drew. Drew lived in Minnesota and worked as an engineer for 3M, which was a sandpaper manufacturer at the time. The process of manufacturing intrigued him, and in 1923 he invented the first masking tape to be used in industrial environments. This adhesive tape was produced from cellophane paper and didn’t have adhesive in the middle, only on the edges. In its first trial run, it fell off the car and the frustrated auto painter growled at Drew, “Take this tape back to those Scotch bosses of yours and tell them to put more adhesive on it!” (By “Scotch,” he meant “stingy”.) 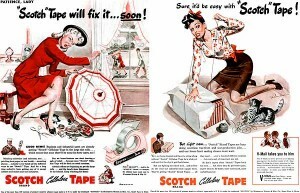 The nickname stuck, both to Drew’s improved masking tape and to his 1930 invention, Scotch Brand cellulose tape. Once launched, the adhesive tape made the adaptation from an industrial tool to a common household instrument. Luckily, economic circumstances were on his side. Due to the Great Depression of 1929, many Americans began using Scotch tape to repair items rather than replace them in an effort to save money. This caused a huge increase in demand for the adhesive tape and allowed Drew achieve success. According to 3M, Drew also invented the first waterproof, see-through, pressure-sensitive tape, which was practical for grocers, bakers, and meat packers. Fast forward to 2012: there are over 20 different types of adhesive tapes in a variety of sizes and colors. From water activated to pre-printed, there is a specific type of tape for every possible project. Tape can be found in almost every store and most types are standardized for easy use in a tape dispenser. (The tape dispenser was created by another 3M engineer, John A Borden.) The next time you are searching for tape, thank those stingy “Scotch bosses” for contributing to the creation of such an essential household object.